You all know that I love the television show Community. I love it so much that last night I watched their most recent panel at PaleyFest. I’ll never get over how talented the entire cast truly is. Jim Rash (Oscar winner!) is sublime as Dean Pelton. The reference humor is great. And there is no laugh track, which I think is genius. If you’re not already watching Community and want to give it a try, I highly recommend starting from the very beginning. It’s not really a show you can just jump into. So, Greendale Human Beings, what is your favorite episode, moment, or line from Community? 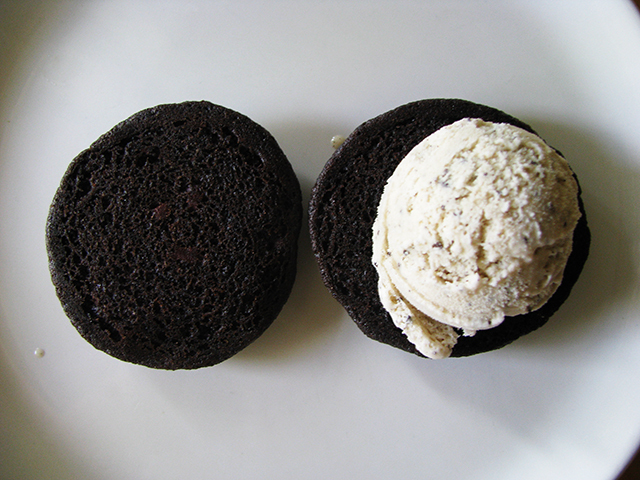 Scoop 1 ½-2 tablespoons of ice cream onto the flat side of one cookie. Top with another cookie and lightly press together. Repeat with remaining cookies and ice cream. Place sandwiches on a parchment lined plate or baking sheet and freeze for about 1-2 hours or until firm. In a medium bowl, add flour, cocoa powder, baking soda, and salt, and stir to combine. Set aside. Fold in semi-sweet and mini chocolate chips. 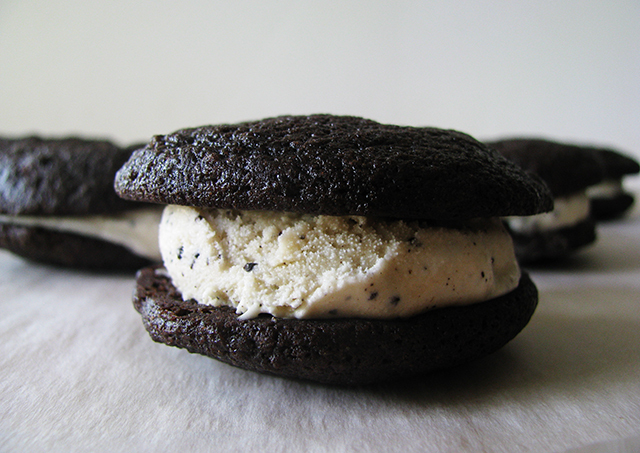 Using a one-inch ice cream scoop, scoop dough onto parchment lined cookie sheets. Bake for 8-10 minutes. Remove from oven. Let cookies cool on the pan for a minute. Remove cookies from the pan and cool completely on wire rack. This entry was posted in Baking, Food and Drink and tagged chocolate, coffee ice cream, Community, cookie, Greendale Human Being, Hulu, ice cream sandwich, Paley Fest, recipe. Bookmark the permalink.